Since 1992, the month of April has also been known as Stress Awareness Month. During this time, experts across the country join forces to increase public awareness about both the causes and cures for our modern stress epidemic. Having a healthy work-life balance is an area many people struggle with. For many of us, the pressure of juggling family priorities, work deadlines and day-to-day life can lead to feelings of overwhelm and anxiety. With work related stress costing Britain 12.5 million working days per year, maybe it is time we pay more attention and prioritise our own work-life balance. We live in a world that never sleeps. Research shows that Smartphone users unlock their phones on average 85 times daily and use it for over five hours a day. With the constant distraction of emails and social media, it is extremely hard to set boundaries of when our working day begins and ends. Furthermore, using our phones at home not only disrupts family time but also affects sleep. 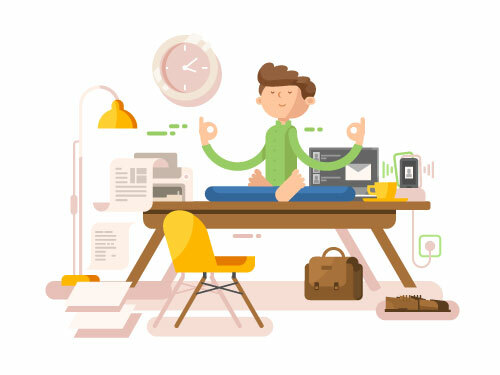 As a tip, to help separate your personal life from your home life, make a rule not to answer any emails in the evening and be present with your family, or take part in a sport or hobby to help you switch off and unwind after a day at work. To help feel on top of life and tasks, it is extremely important that you learn how to work smarter, not harder, to make the most effective use of your time. Review all work meetings to see if they are necessary, and if they are, make sure they are sharp and straight to the point. Try limiting them to 30 minutes with a specific desired outcome. Devote your entire focus to the task at hand. Many people think that they will get more done when multitasking, however multi-tasking can reduce productivity by as much as 40%. Put your phone away, close browsers and concentrate on one task at a time. One of the most beneficial activities to participate in before or after work is exercise. Exercise is a fantastic stress reliever and improves our sense of well-being and overall mood. It is estimated that exercising three times per week can reduce the risk of depression by up to 20%. Exercise helps us to feel more energised and confident which helps us be more productive at work. Try to keep your exercise plan flexible and make it fit around your timetable. For example, you could include lunch-time walks or runs, early morning workouts, or a fitness class on your way home. Try and strike a balance between cardio, weights, and relaxing workouts such as stretching or yoga, to best reap the benefits. Despite everyone leading busy lives, many of us often find ourselves taking on tasks that we don’t have time for or would rather not do. Whether it’s agreeing to overtime, doing someone a favour, or socialising when you don’t want to, if these activities are causing you to feel exhausted or stressed, it is time to learn to say no more often. Saying no can have a very positive influence on your life and is essential when it comes to your work-life balance. Saying no shows you value your time, you understand what you want, and makes it easier to fill your life with activities and people who bring you true happiness. It is important to realise that a healthy work-life balance means something different to everyone and it is crucial to find the right balance for you. However, no matter what career you’re in, or however many additional commitments you have, creating a healthy balance between work, play, and recharging, is essential to leading a happy, healthy and productive life, both at home and in the workplace.